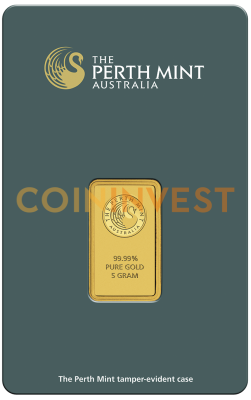 5 g bars of .9999 pure 24 carat gold of the Perth Mint are an easy and affordable way for you to begin your gold portfolio. They don't come with the same high price tag as larger bars, yet they still have all the advantages. Many investors also buy 5 g gold bars in multiples of 25 to give their assets a boost and this popular size is also very easy to resell if necessary. Since it opened for business in 1899, the Perth Mint has produced gold bars that are exceptionally pure. In fact, in 1957 it was noted that the mint's gold was probably the finest in the world. The mint still has the same reputation for quality today and each of these beautifully struck bars is .9999 pure. The 5 g bar depicts the leaping kangaroo motif in reference to Australia's Outback mining tradition on its reverse while its face shows the Perth Mint's iconic swan logo along with the gold's weight and purity. What can you expect when you buy gold bars of this calibre? As well as a full 5 grams of finest 24 carat gold, you will receive your investment bar in a security sealed blister pack that shows the unique serial number clearly. Your gold also comes with a certificate of authentication that is signed by the mint. CoinInvest.com buys products like the 5 g gold bar in bulk so that we can offer our customers the best prices. We ship all orders for this popular gold bar as quickly as possible and in secure packaging so that you can enjoy your purchase sooner. This is how my collection all started with a simple 5 gram gold bar from the Perth Mint.